The Internet has reached into the Peruvian Amazon. Internet cafés (called cabinas públicas) have connected people to the rest of Peru and the world. 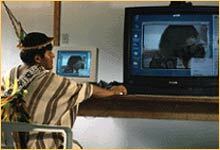 Peru has one of the fastest expanding Internet networks in the developing world. Much of this growth started with a pushy, charismatic organizer, José Soriano, who stubbornly insisted on building up the RCP (Red Cientifica Peruana or the Peruvian Scientific Network) when everything else in Peru was falling to pieces. Founded in 1991, the network was based on public and private universities, as well as other non-profit organizations. The digital explosion was mainly centered on e-mail but it expanded onto the Web quickly. Soriano singlehandedly kept the RCP going and made it unique in the Americas, as noted in this Wired News story, "Reflections of Peru's Web Pioneer". There is also a International Trade Foum interview with him from July 2000. I first met Soriano in 1992 when I was visiting Peru for the Federation of American Scientists. The RCP was still in diapers, operating mostly with donated equipment and unpaid university students eager to get their hands wet with new technology. RCP offered mainly e-mail services, at a time when public services seemed to be collapsing. I met him again when I came back to Peru in 1993-96 to work for the International Potato Center. It was one of the founding institutions in those early days, even though they had other options for telecommuncations because they say it as crucial for fomenting research and low-cost communications. Soriano was touchy to work with because he was feuding with the Spanish telephone company that had purchased the formerly public telephone company and wanted to squash all competition. But I could see first hand the importance of Internet access and e-mail on the isolated researchers associated with CIP. Those early days went a long way towards kindling my enthusiasm for the Internet. I can remember downloading my first applications and utilities -- strange programs to connect with services called gophers, ftp and telnet. I got the first versions of a web browser. In 2003, RCP revamped its websites and they look at lot better. Yachay is its web directory. It also serves as the registry for Peruvian domain names. It has a online report about the Internet in Peru in Spanish. However, in the past few years, Telefónica del Peru has taken the lead in expanding the Internet. It has undertaken a great cultural portal and and web directory. It's all part of its public relations efforts of the Spanish telephone company to win friends after buying its way into the Peruvian market. 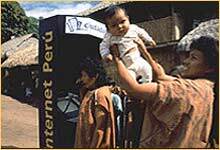 When I revisted Peru in October 2002, I found that there were public Internet booths on almost any corner. These places, called cabinas pública or cybercafés, allow you to check your e-mail or browse for information on the web. They are inexpensive, about $0.50 per hour. They are frequently opened around the clock. An International Telecommunication Union study on the impact of telephony over Internet Protocol (IP). The study illlustrates the clash between an incumbent phone company, Telefónica del Perú, and new uses of Internet-based phone services. Information Technology in Peru by Jeffrey S. Bernstein, a graduate of American University's Masters of Business Administration program. An excellent job of providing an overview of the impact and potential of IT in a developing country. Although the Peruvian volume of Internet traffic is small when compared to Brazil or Argentina, its impact on the country is large.